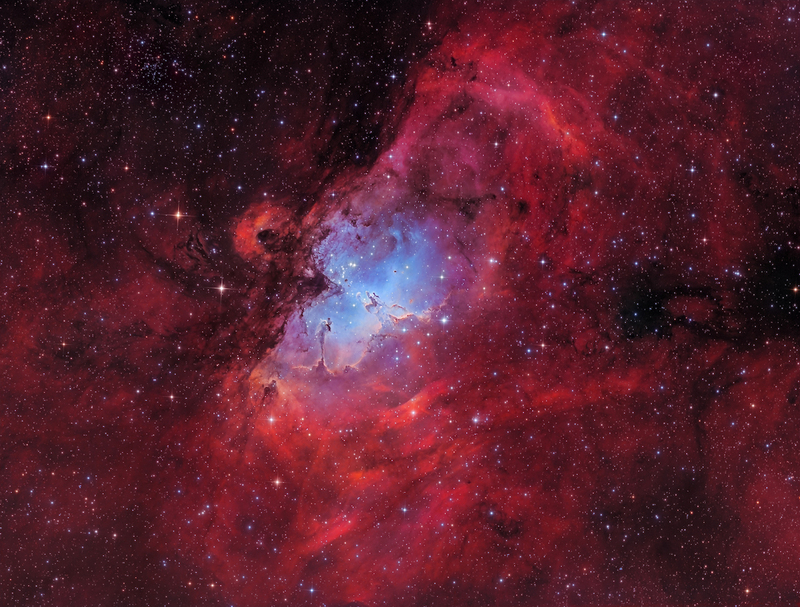 “The Eagle nebula” by Marcel Drechsler (Germany). “The Eagle Nebula, also known as Messier 16, is a young open cluster of stars, surrounded by hot hydrogen gas in the constellation Serpens and lies at a distance of 7,000 light years from Earth. Taken at the Baerenstein Observatory in Germany, the photo is a RGB-Ha-OIII image and shows off the radiant red and blue colors of the nebula. In the center, you can spot the famous Pillars of Creation.” Baerenstein, Germany, 9 August 2017. Celestron RASA telescope, Baader narrowband filters, Celestron CGEpro mount, ZWO Asi1600mmc camera, 620mm f/2.2 lens, ISO 139, 10.5 hours exposure. 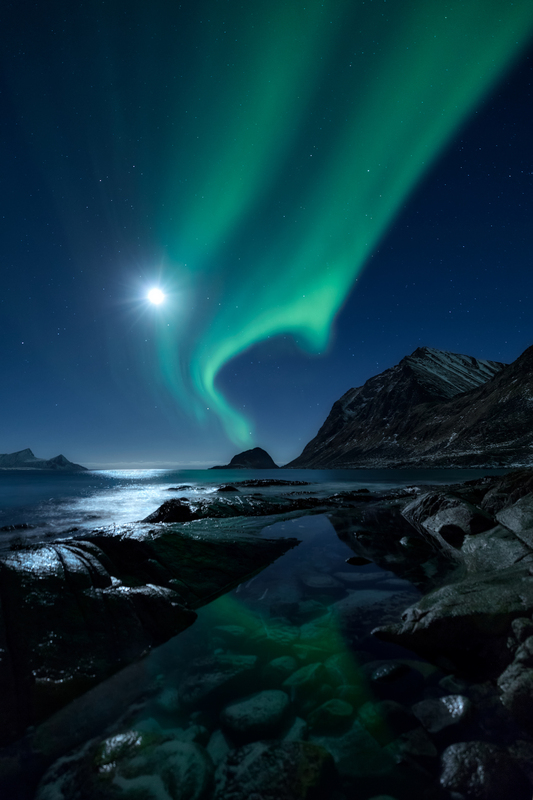 Aimed at awarding the best international space photography, the Insight Investment Astronomy Photographer of the Year contest celebrates its 10th anniversary. The astrophotography competition is run by the Royal Observatory Greenwich in London and showcases the immense talent it takes to capture space and the night sky. The competition has announced the shortlist of its 2018 contest—winners will be announced in October—with entries from around the globe. Whether photographing mysterious nebulae and galaxies or the magic of the Aurora borealis, each image brings the wonder of the universe into focus. The expert panel will have a difficult task to select winners from among this talented group of astrophotographers. 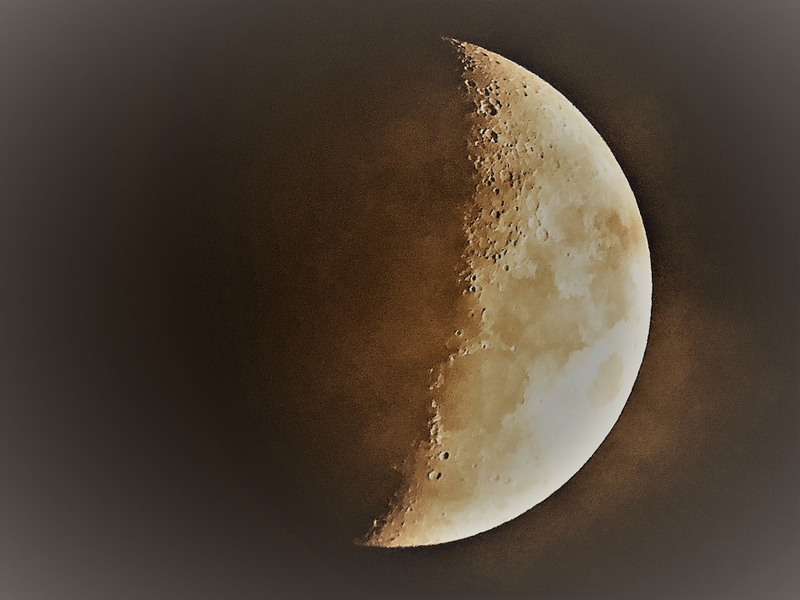 While many of the shortlisted images use high powered telescopes and professional cameras, it’s interesting to note that Casper Kentish made the cut with his photo of the moon shot on an iPad. The Royal Observatory’s interest in astrophotography continues year round with a Facebook group dedicated to astrophotos and tips for taking great space photos. After the winners are announced, their work will go on display in a new gallery at the National Maritime Museum. In the mix will also be a selection of top photographs from the contest’s history. See all the shortlisted images from the Insight Investment Astronomy Photographer of the Year contest, and read the stories behind each photo. “The Hidden Galaxy” by Tom O’Donoghue, Olly Penrice (Republic of Ireland). 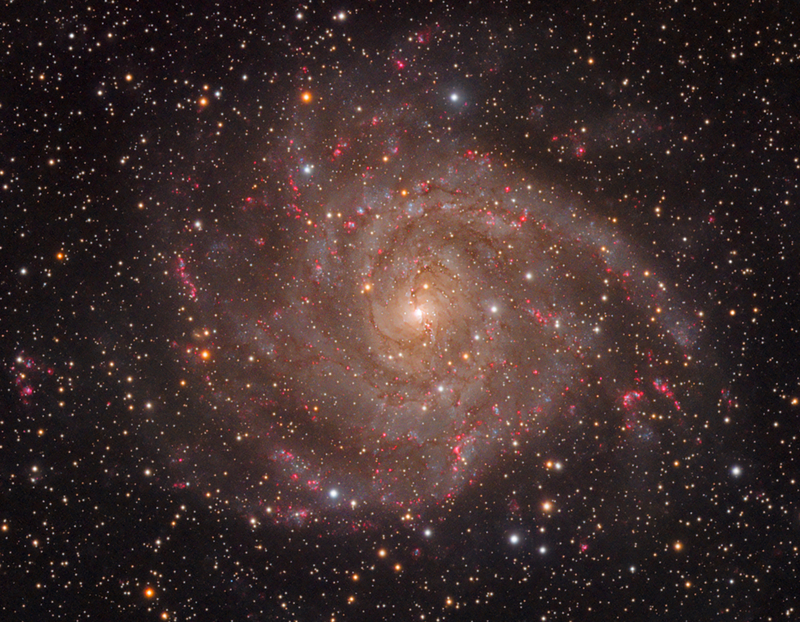 “Camelopardalis, also known as the Hidden Galaxy is one of the largest Galaxies visible from the Northern Hemisphere; however it is also obscured by foreground stars and dust, as it lies in the Milky Way plane. The photographer added a Ha filter to this LRGB image in order to enhance the emission nebula regions in the galaxy and after stacking single exposures (subs) the brilliant spiral arms at the core were revealed.” Etoile St Cyrice, France, 18 December 2017. Tec140 telescope, Tech140, Mesu 200 mount, Atik 460ex camera, 1000mm f/7 lens, 24 hours in 600s subs. “The neglected neighbour” by Kfir Simon (Israel). 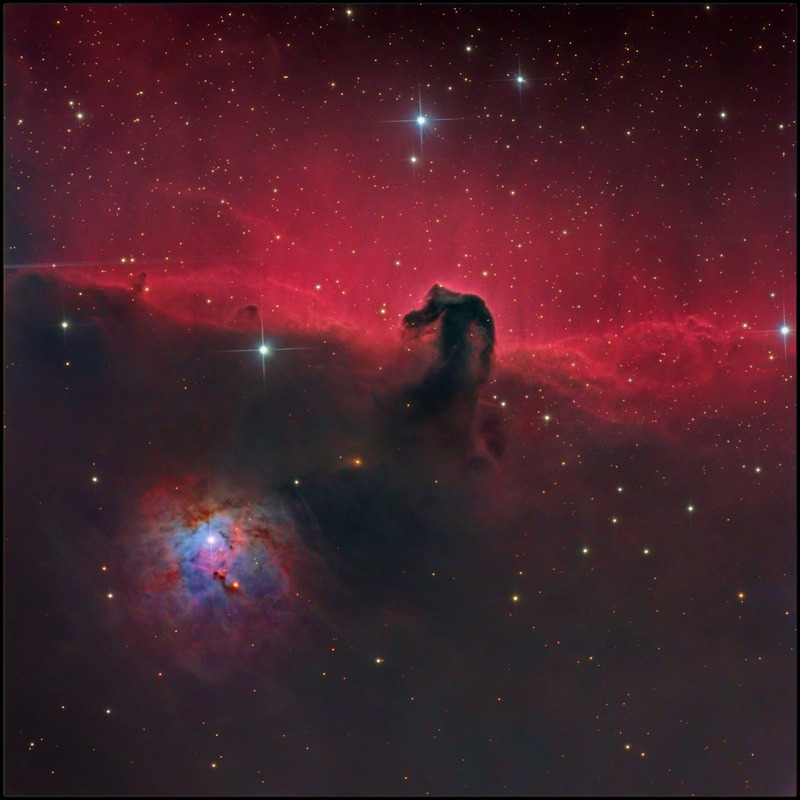 “Taken from Tivoli Southern Sky Guest Farm in Namibia, the great Horsehead nebula is overlooking the striking and often overlooked Nebula NGC 2023. At 4 light years in diameter it is one of the largest reflection nebulae ever discovered.” Tivoli Southern Sky Guest Farm, Namibia, 4 January 2018. 16″ Hypergraph F8 telescope, ASA DDM85 mount, FLI Proline PL16803, 3250mm f/4.5 (406mm aperture) lens, LRGB image Lum 120min Bin 1 RGB 20 min each Bin2. 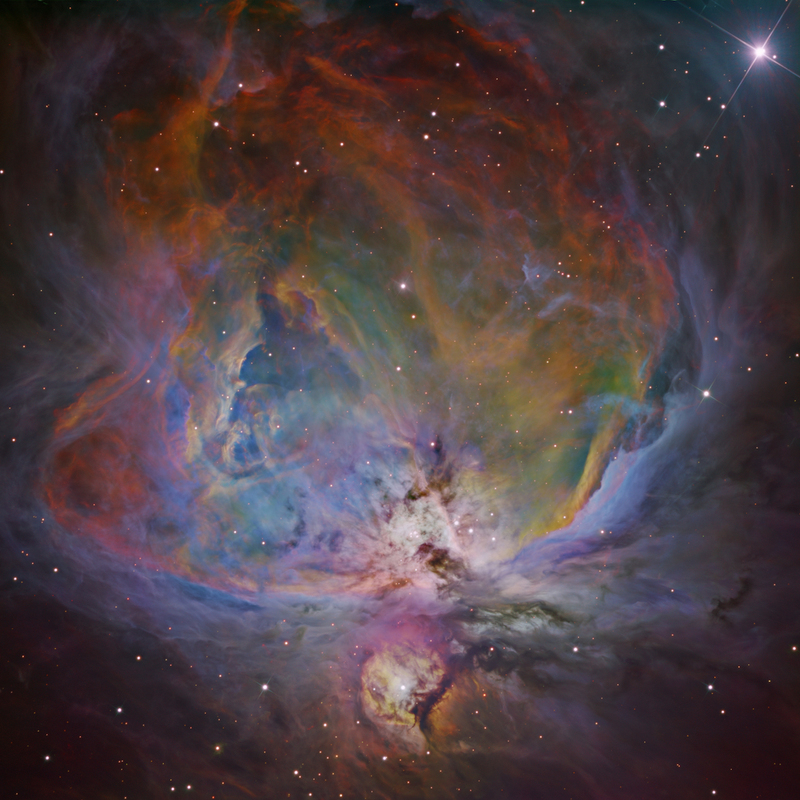 “The Orion Nebula in 6-Filter Narrowband” by Bernard Miller (USA). 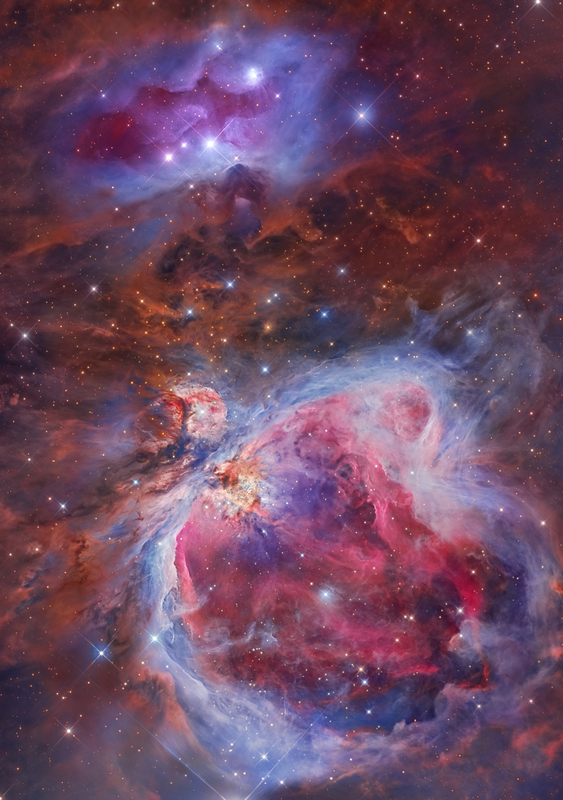 “One of the brightest nebulae, the M42 or the Orion Nebula, is located in the Milky Way south of Orion’s belt. It is an emission nebula about 1500 light years away in the constellation Orion. 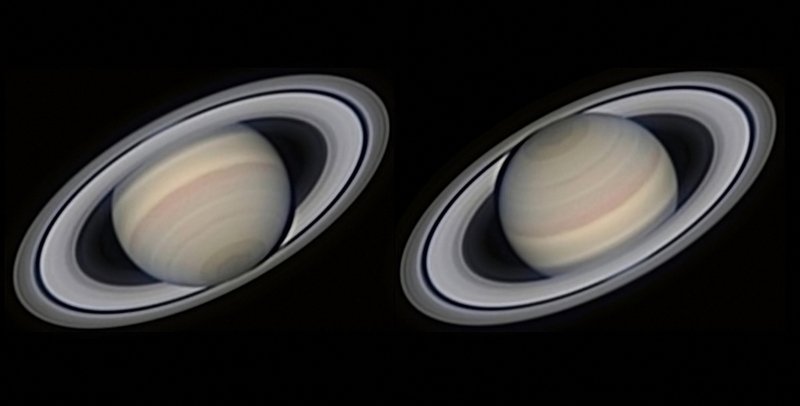 This image was produced by combining 36 hours of total exposure using six different filters; Ha, SII, OIII, Red, Green, and Blue. The central Trapezium cluster of the nebula is so bright that it is usually over exposed with the long exposures needed for the nebula. In this image a series of short 3-second exposures in each filter were blended with the long exposures to create a high dynamic range image that produces detail in the faint nebula and bright Trapezium.” Animas, NM, USA, 25 December 2017. Planewave CDK-17 telescope, Paramount ME mount, FLI PL16803 camera, 2940mm f/6.8 lens, 18×30 minutes Ha, 18×30 minutes SII, 18×30 minutes OIII, 12×15 minutes Red, 12×15 minutes Green, 12×15 minutes Blue, 16×30 seconds RGB exposures. “Thunderstorm under milky way” by Tianyuan Xiao (China). 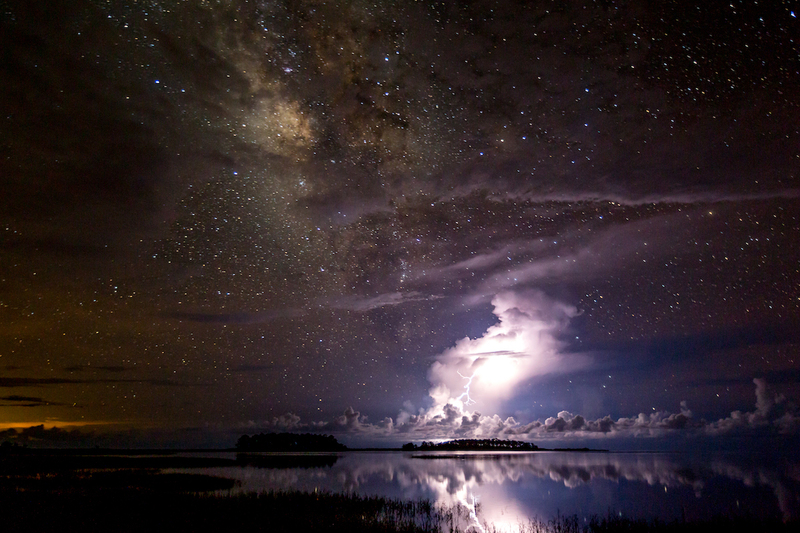 “A glorious Milky Way looms over a thunderstorm that lights up the Florida sky. The photographer wanted to show the great contrast between stable (Milky Way) and moving (thunderstorm) objects in the sky.” Perry, USA, 21 August 2017. Canon EOS 5D Mark III camera, 25mm f/3.2 lens, 30/1 exposure. “Mosaic of the Great Orion & Running Man Nebula” by Miguel Angel García Borrella and Lluis Romero Ventura (Spain). “The Orion Nebula, also known as Messier 42, M42, or NGC 1976, is a diffuse nebula situated in the Milky Way, south of Orion’s Belt in the constellation of Orion. It is one of the brightest nebulae and is visible to the naked eye during a clear night sky. M42 is 1270 light years from our planet and is the closest region of massive star formation to Earth. It is estimated to be 24 light-years across and it has a mass of about 2,000 times more than that of the Sun. This image is the result of the efforts of two astrophotographers using different equipment from their observatories. Located hundreds of kilometers away from each other, they chose the Orion Sword are as a common target to render. The software suites used in this image are Maxim DL, Pixinsight and Photoshop CC 2017.” Àger, Monfragüe, Spain, 2 January 2017. Astrodon LRGB Gen2 I-Series True-Balance telescope, Astrodon LRGB Gen2 I-Series True-Balance, Titan 50 Losmandy & ASA DDM85 mount, SBIG & Moravian STL 11000 C2 & G3-11002 camera, 2720mm and 2840mm f/6.8 and f/8 lens, 42 hours exposure. 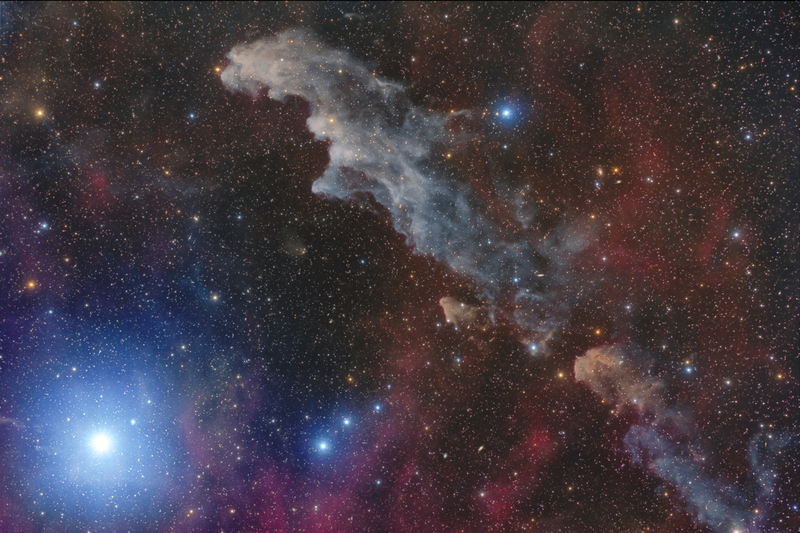 “Rigel and the Witch Head Nebula” by Mario Cogo (Italy). “The dark Namibian sky was the perfect location to capture the wonder of the Witch Head Nebula and Rigel. The Witch Head Nebula is a very faint molecular gas cloud which is illuminated by supergiant star Rigel, the seventh brightest star of the sky and the brightest star in the constellation of Orion.” Tivoli Southern Sky Guest Farm, Namibia, 20 August 2017. Takahashi FSQ 106 ED telescope, Astro-Physics 1200 GTO mount, Canon EOS 6D Cooling CDS Mod camera, 385mm f/3.6 lens, ISO 1600, 1, 3 and 6 mins total 5 hours exposure. “NGC 6726 and NGC 6727” by Mark Hanson, Warren Keller, Steve Mazlin, Rex Parker, Tommy Tse, David Plesko, Pete Proulx (USA). 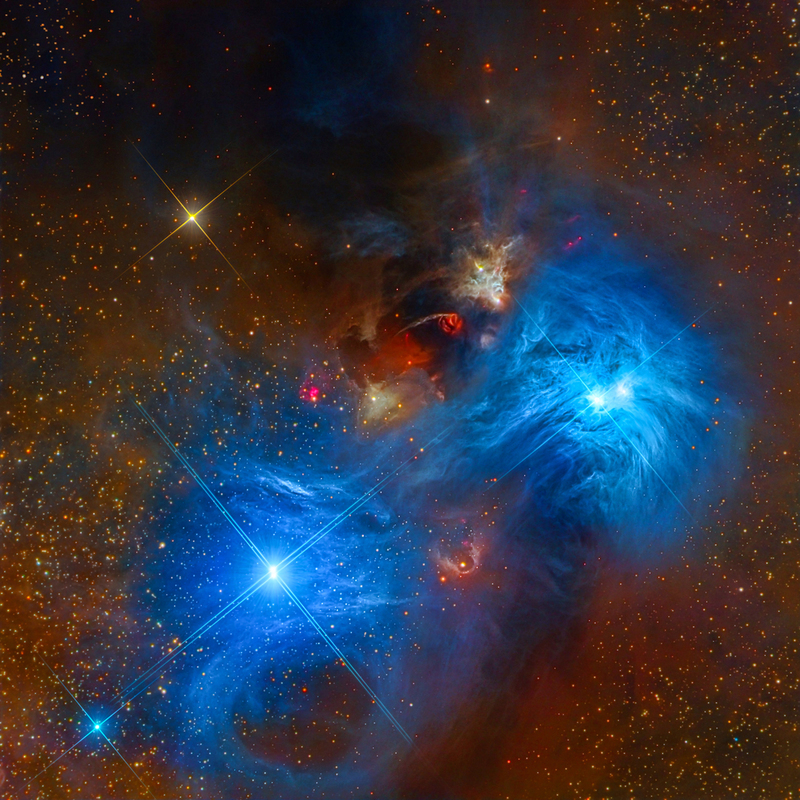 “These spectacular reflection nebulae in the Corona Australis constellation depict the characteristic vivid blue color produced by the light of hot stars, reflected by silica-based cosmic dust. A rare high-resolution view of the cores NGC 6726 and 6727 is captured on camera. The data was acquired by Star Shadows Remote Observatory at CTIO’s PROMPT2, using LRGB filters, stacked with CCDStack and post-processed in Photoshop and PixInsight.” La Serena, Chile, 30 June 2017. RCOS 16″ research telescope, PlaneWave Ascension mount, FLI PL 16803 camera, 4,500mm f/11.3 lens, 180,000 seconds 1,800s x ~100 exposures L,R,G,B = ~50 hours total exposure. Stokksnes, Iceland, 16 February 2018. Canon 5D mark III camera, 16mm f/1.6 lens, ISO 10000, 6/1 exposure. “Milky Way shining over Atashkooh” by Masoud Ghadiri (Iran). “The Milky Way stretches across the night sky between four columns in the ancient Atashkooh Fire Temple near Mahllat city in Iran. The camera was placed on the ground in the center of the four columns, and with no use of any other equipment, the photographer managed to capture our magnificent galaxy using just one image.” Mahallat, Iran, 2 May 2017. Nikon D810 camera, 15mm f/2.8 lens, ISO 3200, 29/1 exposure. “Holding Due North” by Jake Mosher (USA). 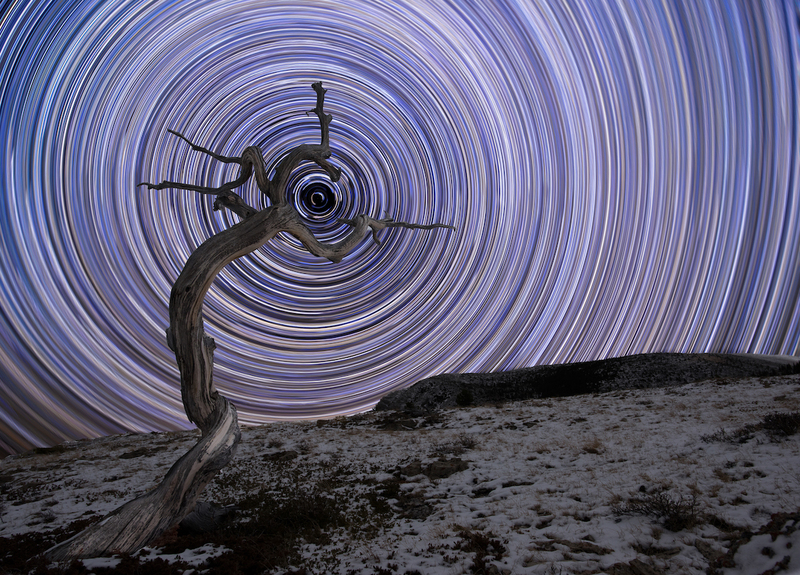 “A weathered juniper tree in Montana’s northern Rocky Mountains is filled with arced star trails and in the center sits Polaris, the brightest star in the constellation of Ursa Minor. It took several test frames of long exposures to make sure that Polaris was in the right position, but eventually, things lined up and the Moon provided enough light to the foreground, yet plenty of dark skies to allow a high enough ISO to capture lots of stars.” Choteau, MT, USA, 23 November 2017. Nikon D810 camera, 20mm f/4 lens, ISO 1600, multiple 40-second exposures. “Holy Light II” by Mikkel Beiter (Denmark). 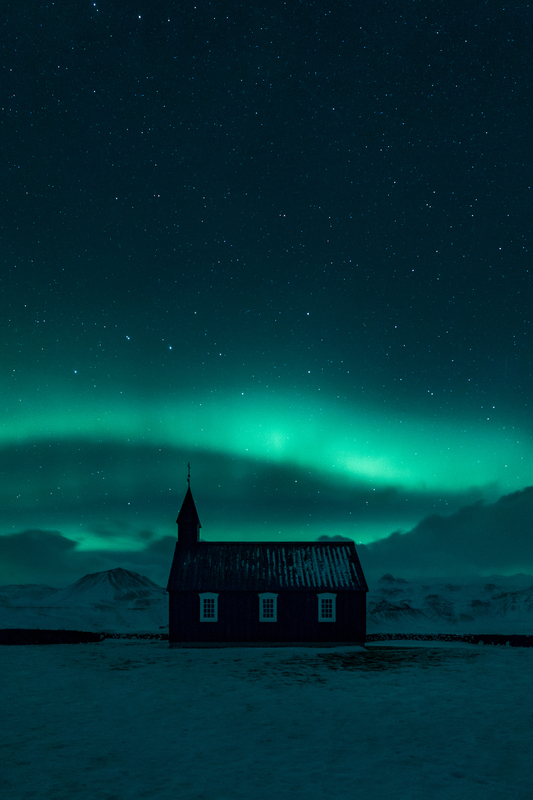 “The Black Church at Búðir in Iceland beneath the stripes of the Aurora Borealis and the bright stars in the night sky. Fighting the worst weather the photographer had ever encountered in Snæfellsnes Peninsula and with strong gale winds around 30 meters per second on the night the image was taken, his hard work paid off.” Búdir, Iceland, 23 November 2017. Canon EOS 5d Mark IV camera, 16mm f/2.8 lens, ISO 3200, 10-second exposure. “Ice Castle” by Arild Heitmann (Norway). 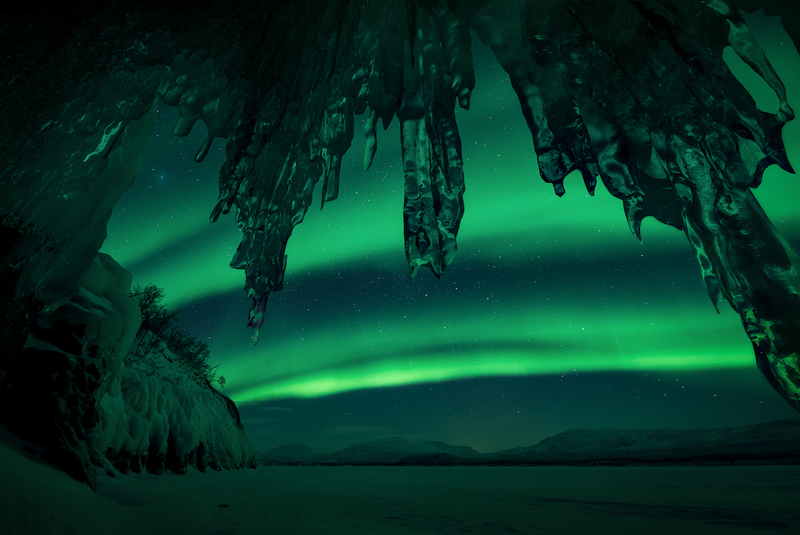 “A remarkable display of the Northern Lights reflecting shades of green and yellow on the snow. Squeezed into a tiny cave on Lake Torneträsk, in Swedish Lapland, in minus 26 degrees with the camera lens just a few centimeters away from the icicles, it was a challenge well worth it for the photographer.” Abisko, Sweden, 18 February 2018. Sony A7S2 camera, 14mm f/2.5 lens, ISO 2500, 10-second exposure. “Kynance cove by night” by Ainsley Bennett (UK). 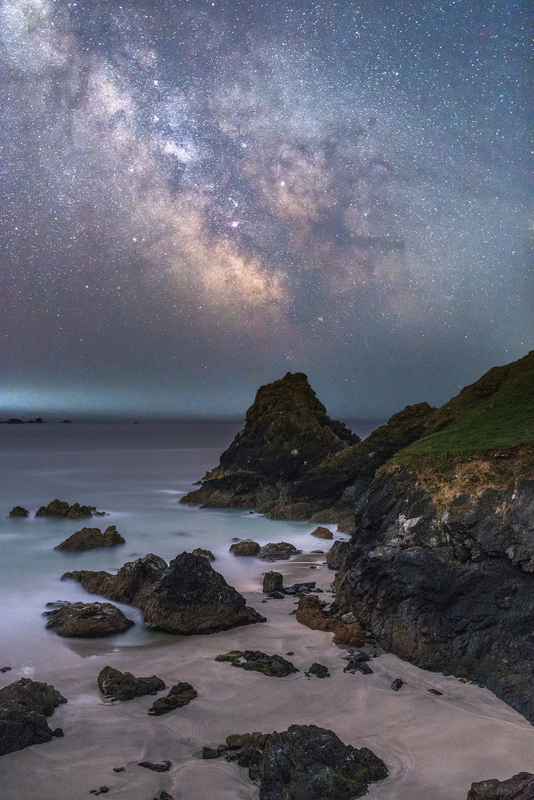 “On a family trip to Cornwall after visiting Kynance Cove, on the Lizard Peninsula, the beautiful landscape seemed to be the ideal place for the photographer to capture the glimmering stars and the striking colors of the Milky Way illuminating the beautiful rocky coastline. This is a composition of two separate exposures, one for the sky and one for the foreground blended together post-processing to achieve the desired result, producing a more even exposure.” Kynance Cove, Cornwall, UK, 3 May 2017. Nikon D810 camera, 35mm sky: f/2.2 foreground: f/3.2, ISO sky: 4000 foreground: 1600, sky: 13-seconds foreground: 310-seconds exposure. “Guarding the galaxy” by Jez Hughes (UK). 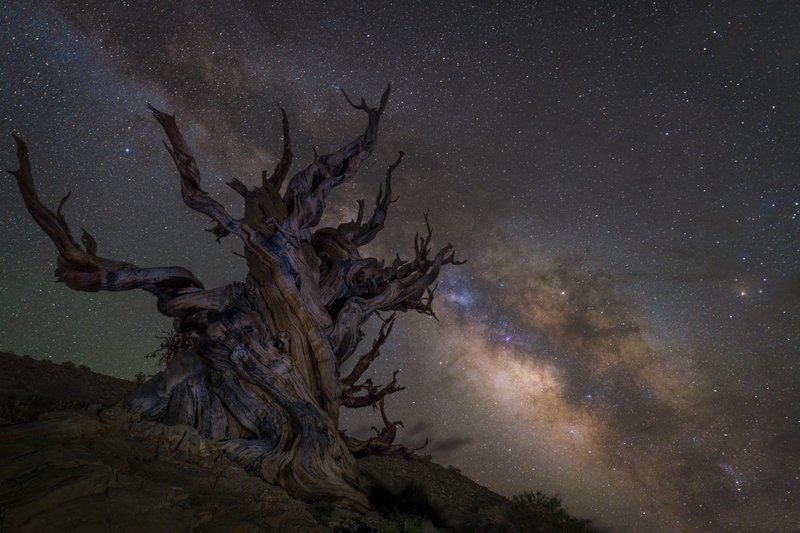 “The Milky Way rises over some of the oldest trees on Earth in the Ancient Bristlecone Pine Forest, set within the Inyo National Forest along the White Mountains in California. Growing at altitudes of over 10,000 feet, these trees can live for over 4,000 years. The high elevation also results in thin air and incredibly dark skies on display. This photograph was taken in between rolling thunderstorms which were passing through the Eastern Sierras, leaving time for only a few exposures.” Bishop, USA, 19 June 2017. Sony ILCE-7RM2 camera, 24mm f/2.8 lens, ISO 3200, sky: 20-second exposure, tree light painting: 8-second exposure. “Cable Bay” by Mark Gee (Australia). 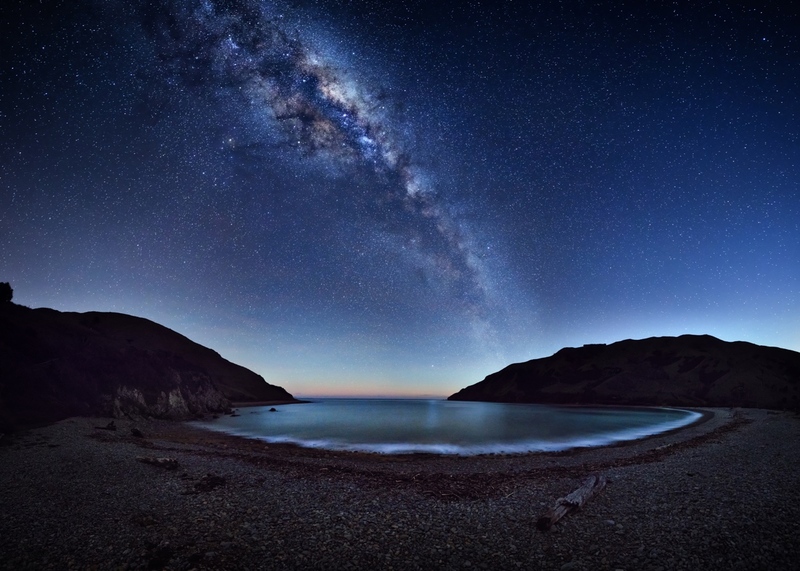 “The magnificent Milky Way stretches across the night sky reflecting on the Cable Bay near Nelson, New Zealand. The photographer had to take the picture before the light washed out the sky. 42 individual images were stitched into a large multi-row panorama to create this image.” Nelson, New Zealand, 12 August 2017. Canon EOS 6D Mark II camera, 24mm f/4 lens, ISO 6400, 42 x 30-seconds exposure. “Cave Man” by Brandon Yoshizawa (USA). 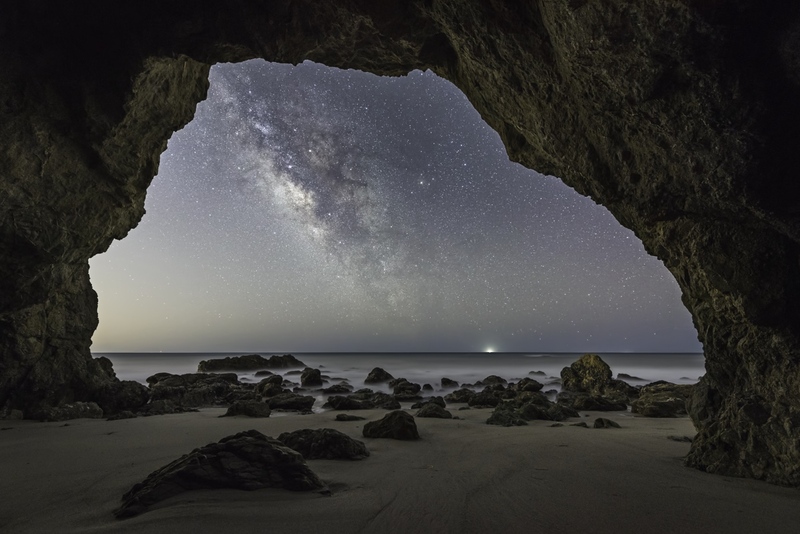 “Battling the light pollution in Malibu, California the photographer brilliantly framed our galaxy, the Milky Way, inside a sea cave, 25 miles away from the heart of downtown Los Angeles. In order to achieve this outstanding shot planning it ahead and waiting for the perfect conditions of low tide and clear skies was very important. The image required two exposures; one to capture the details of the dark cave and one for the Milky Way. Both exposures were taken back to back without moving the camera or changing the composition.” Malibu, USA, 28 March 2017. Nikon D750 camera, 14mm f/4 lens, ISO 1600, 119/1 exposure. 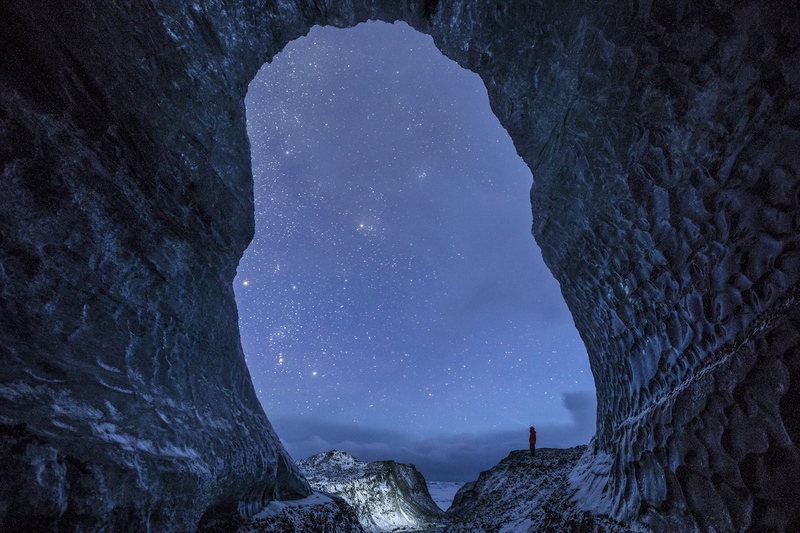 “Deep Space” by Dave Brosha (Canada) “Exploring the remarkable underbelly of the Breiðamerkurjökull glacial tongue in Iceland. With this image the photographer wanted to pay tribute to the serenity and wonder he felt while he spent some time in this peaceful and magnificent place.” Vatnajökull, Iceland, 5 February 2018. Canon EOS 5D Mark IV camera, 14mm f/2.5 lens, ISO 3200, 30/1 exposure. “Aurorascape” by Mikkel Beiter (Denmark). “The conditions the night the image was taken were not ideal because of the bright moon lighting up the sky. The photographer managed to overcome this obstacle and capture the incredible Aurora Borealis above the fjord at Haukland in the gorgeous Lofoten archipelago, Northern Norway. The small pool of water with rocks made the perfect foreground and a natural leading line into the frame.” Haukland Beach, Norway, 26 February 2018. Canon EOS 5DS R camera, 17mm f/2.8 lens, ISO 2000, 8-second exposure. “Aurora Borealis on the coast of the Barents Sea” by Michael Zav’yalov (Russia). 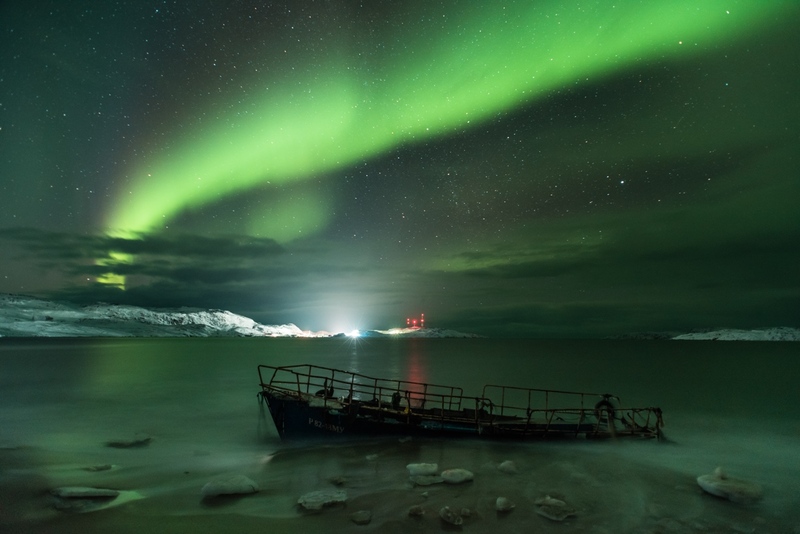 “From the city of Yaroslavl in Russia to the coast of the Barents Sea in the Arctic Circle, a party of three traveled 2000 kilometers to capture the magnificent Northern Lights. The photographer stayed in the village of Teriberka in the Murmansk Oblast district for five days. After four days of bad weather, with heavy snow and thick clouds, the sky finally cleared on the last day and the Northern Lights appeared in all their glory.” Murmansk/Teriberka, Russia, 28 February 2017. Nikon D750 camera, 20mm f/4 lens, ISO 2000, 30/1 exposure. “Earth Shine” by Peter Ward (Australia). 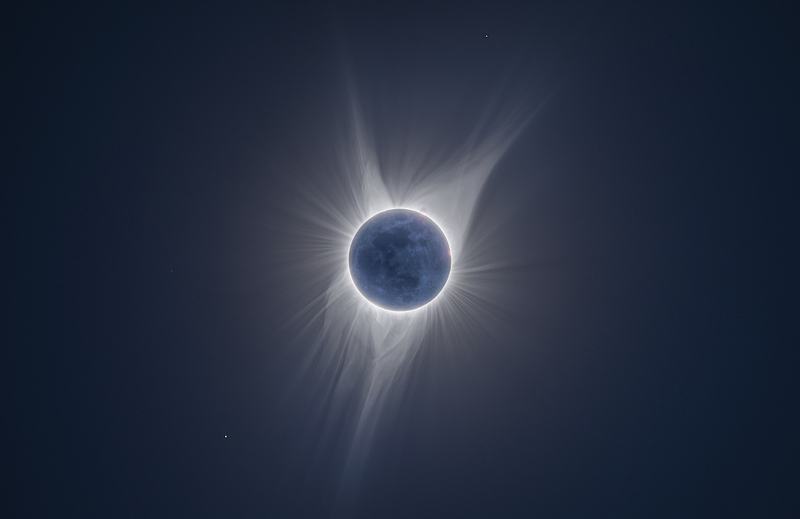 “During a solar eclipse, the brightness of the solar corona hides the details of the moon. By layering 9 exposures ranging from 2 seconds to 1/2000th of a second and with Extreme High Dynamic Range photography or XHDR the image shows not just the radiant solar corona, but the newest possible of new moons, seen here illuminated by sunlight reflecting off the earth.” Jackson Hole, USA, 21 August 2017. Takahashi FSQ85 telescope, Losmandy Starlapse mount, Canon 5D Mark IV camera, 9 exposures ranging from ISO 100 to 900, 2 seconds through to 1/4000th exposures. “Daytime Moon” by Helen Schofield (UK). 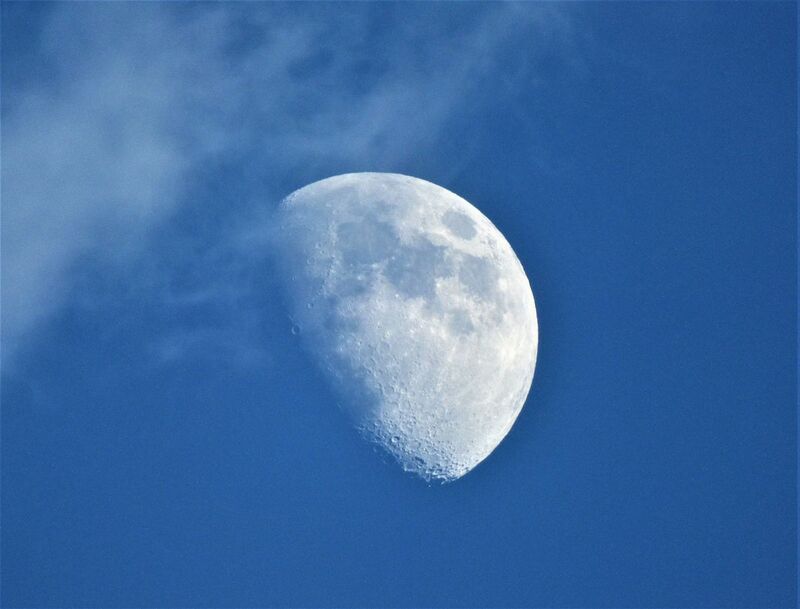 “Earth’s only natural satellite is situated above the horizon of our planet so it is visible during daytime and the waxing gibbous phase can clearly be seen in the sky. The photographer captured this imposing image in Malaga, Spain while vacationing with her children.” Malaga, Spain, 1 August 2017. Panasonic DMC-FZ72 camera, 215mm f/5.9 lens, ISO 100, 1/160 exposure. “Guardian of Tre Cime” by Carlos F. Turienzo (Spain). 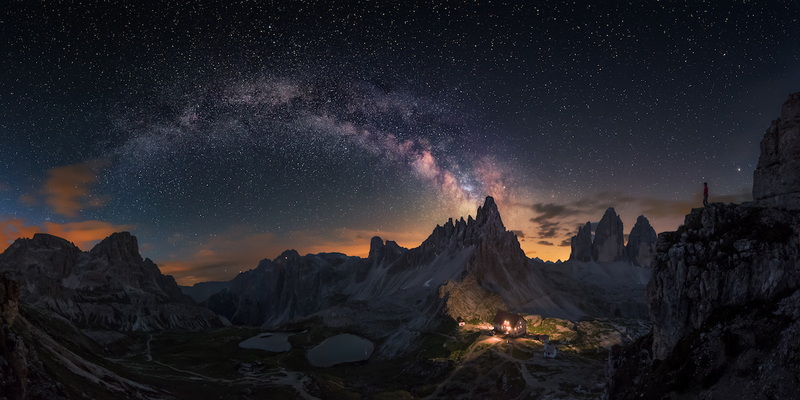 “This panoramic image, composed out of eight photos, depicts the Milky Way emerging over the rocky Dolomites in Tre Crime on the left and on the right the lights from a house illuminating the beautiful terrain. The photographer noted that the image represents sharing an unforgettable moment with the ones you love.” Tre Cime, Italy, 25 June 2017. Nikon D750 camera, 14mm f/3.3 lens, ISO 3200, 8×20-seconds exposure. “Keeper of the Light” by James Stone (Australia). “The Milky Way rises above an isolated lighthouse in Tasmania. 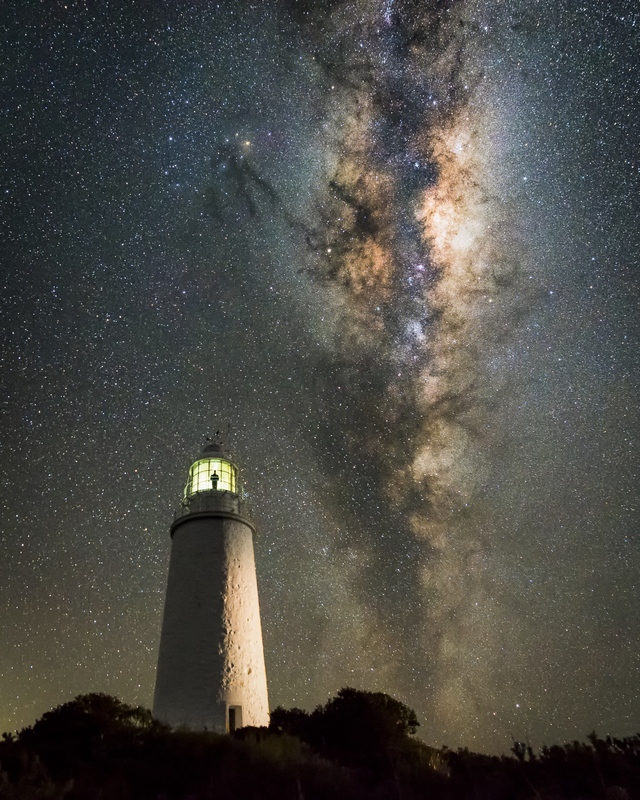 The photographer planned his position to shoot the perfect composition positioning the Milky Way in conjunction with the lighthouse and observing how to best light the tower for artistic effect. This image is part of a time-lapse sequence, allowing the photographer some time to climb the tower into the lantern room of the lighthouse and reflect on the hard and lonely, yet incredible life the former lighthouse keepers would have lived.” Bruny Island, Tasmania, Australia, 21 July 2017. Nikon D750 camera, 15mm f/3.2 lens, ISO 6400, 15-second exposure. “Andromeda galaxy” by Péter Feltóti (Hungary). 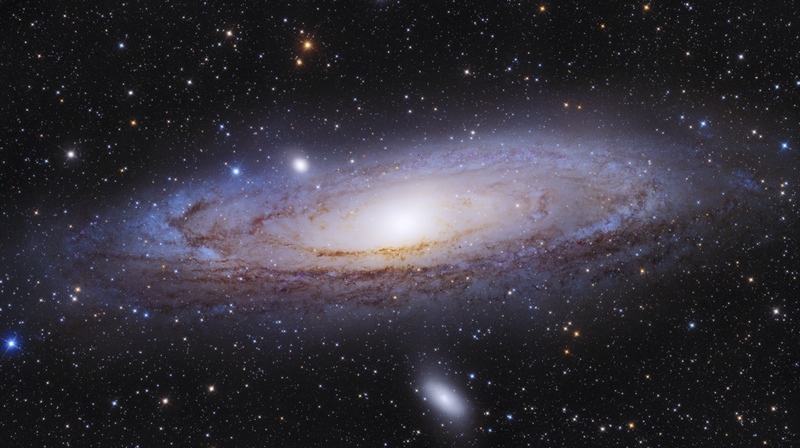 “Andromeda Galaxy has always amazed the photographer. The dust lanes and bright star clusters in its arms, the emblematic galaxy shape of it, and the magnificent look of this great star city make it one of his most desired objects to photograph. This image was taken using a 200mm mirror and creating a three-panel mosaic.” Mezőfalva, Hungary, 20 October 2017. SkyWatcher 200/800 Newton astrograph telescope, SkyWatcher NEQ6 pro mount, Canon EOS 600D camera (modded), 800 mm f/4 lens, ISO 800, 3.79-second exposure. “Expedition to Infinity” by Jingpeng Liu (China). 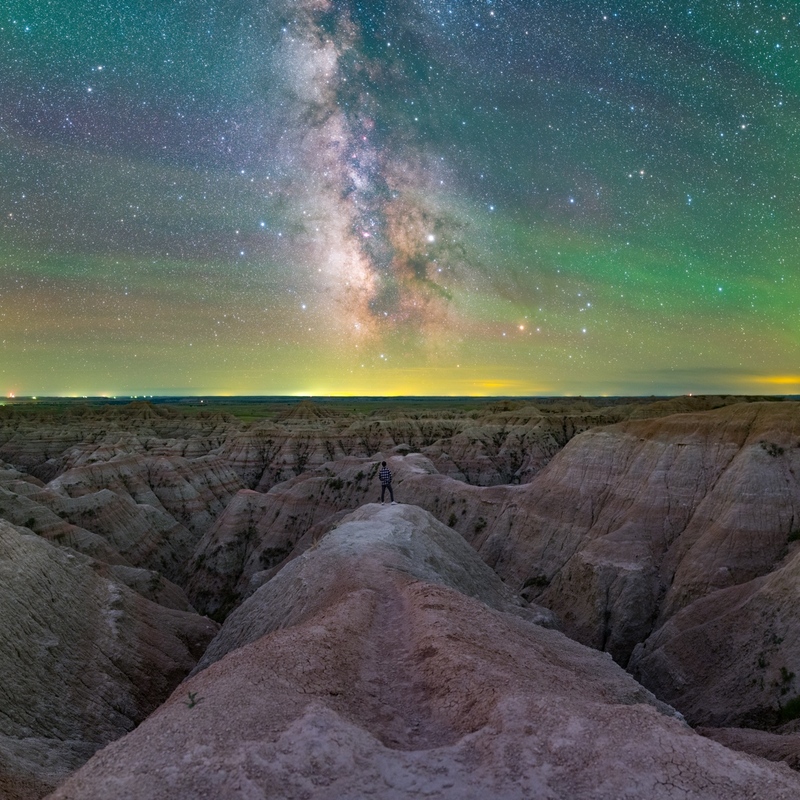 “The photographer captured the splendor of our galaxy in Badlands National Park, in South Dakota and is a panoramic view of a 6-shot composite, three for the sky and three for the foreground, all of which were taken successively using the same gear and equivalent exposure settings, from the same location, within a short period. The raw files were initially processed in Lightroom for lens correction only, followed by merging to panorama in Photoshop. Final retouching was applied back in Lightroom, including WB correction, basic toning, and local adjustments.” Badlands National Park, USA, 24 June 2017. Canon EOS 6D camera, 24mm f/2 lens, ISO 4000, 120-seconds exposure. “Empyreal” by Paul Wilson (New Zealand). 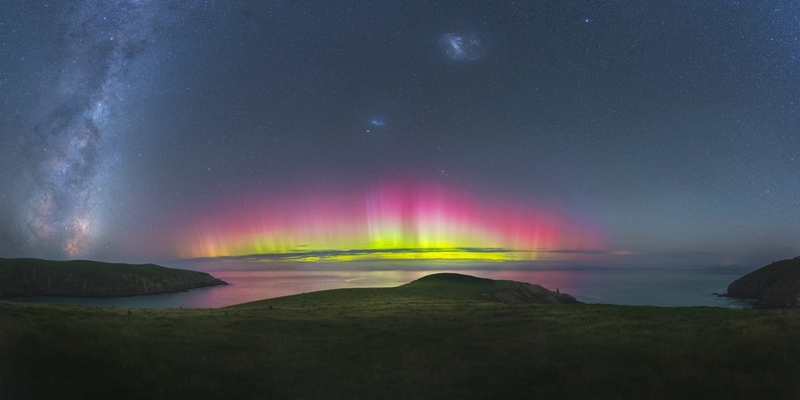 “A flared up Aurora reflects bright pink and yellow colors on the water at Southern Bays near Christchurch, New Zealand. The incredible combination of the radiant Aurora colors, the wide green fields, and the dark blue, starry night sky paint a spectacular picture and accentuates the wonders of our galaxy.” Te Oka, New Zealand, 23 April 2017. Canon 6D camera, 50mm f/1.8 lens, ISO-6400, 64×10-seconds exposure. “Color-Full Moon” by Nicolas Lefaudeux (France). 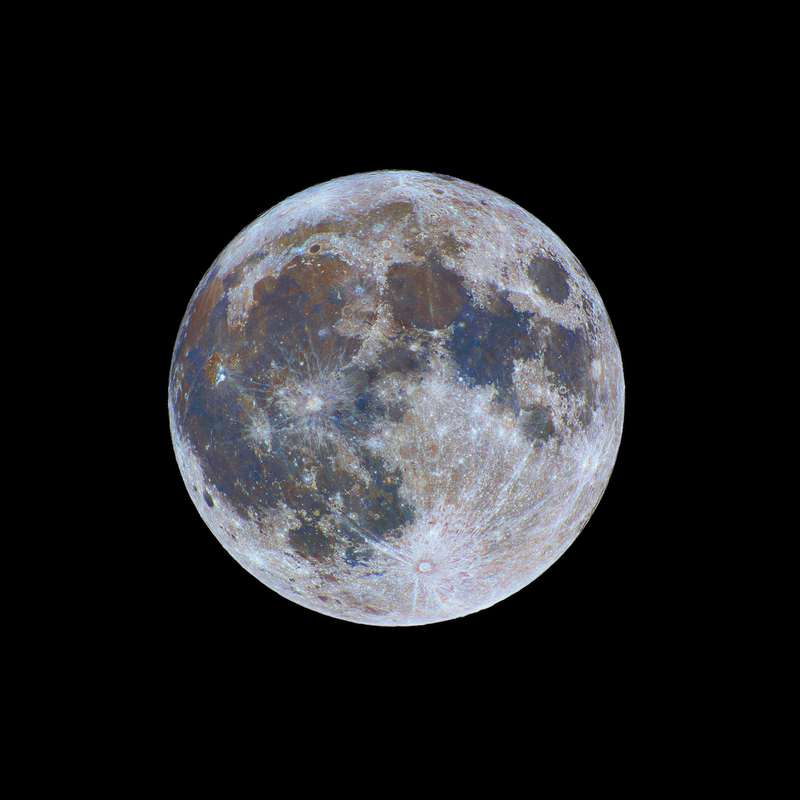 “A phenomenal image depicting the incredible colors and details of the surface of the Moon. The photographer applied a similar procedure he used for capturing the solar eclipse and noted that this lit up the full Moon like a Christmas tree ornament, with a great variety of hues and shades.” Paris, France, 3 January 2018. SkyWatcher Black Diamond 100mm apochromatic refractor telescope, 1800mm f/18 lens, Vixen GP2 equatorial mount, Sony ILCE-7S2 camera, 25 images of 1/100s exposure. “Stars over Sacred Mongolian Ovoo” by Qiqige Zhao (China). 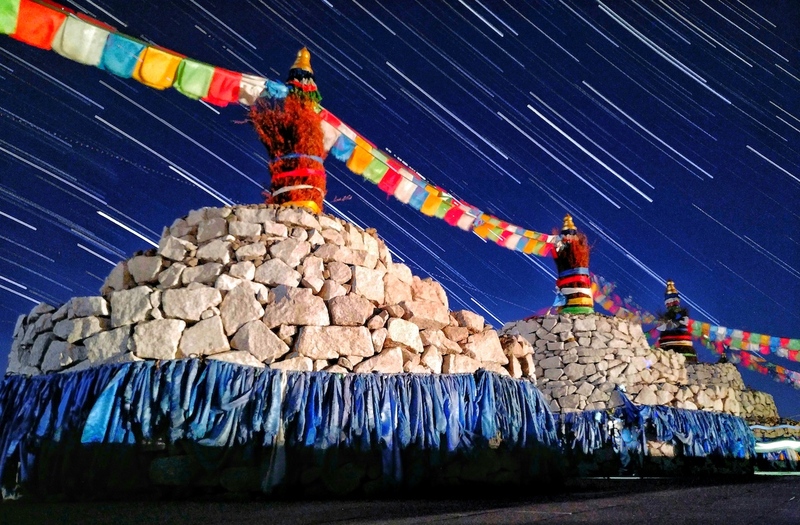 “Taken during a summer night in Mingantu in Inner Mongolia, star trails are sweeping over the colorful and extraordinary sacred altars, called Ovoo, creating a spectacular painting.” Mingantu, Inner Mongolia, China, 11 August 2017. Nubia Z11 camera, 4mm f/2 lens, ISO 3200, multiple 10-second exposures. “AR 2665 and Quiescent Prominence” by Łukasz Sujka (Poland). “The sunspot AR2665 was one of the most active regions in 2017 on the right you can see a phenomenal quiescent prominence extending from our star, the Sun. This type of prominence lasts for a very long time and its structure is quite stable. 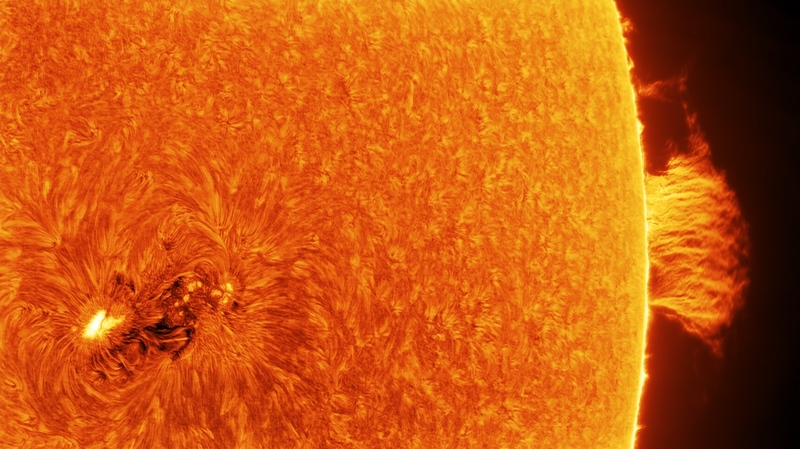 The photo is a composition of two images: one of the magnificent prominence and one of the Sun’s surface. The surface is much brighter than the prominence so it is a negative to reveal details of Sun chromosphere (spicules and filaments).” Budy Dlutowskie, Poland, 9 July 2017. TS Individual 102/1100 telescope, etalon from Lunt50ThaPT+B1200+BelOptik ERF+TV barlow x2, Sky-Watcher NEQ6 Pro mount, ZWO ASI 178 MM-C camera, 1100mm f/11 lens, 10ms exposure. “First Impressions” by Casper Kentish (UK). “After a few days of cloudy skies, the photographer finally got the chance to use his birthday present, a new telescope. The clouds were moving fast so there was not much time to capture the Moon. With the help of his grandfather who kept moving the telescope and trying to keep an iPad at the right position, he managed to capture this wonderful and artistic image of his first viewing of our Moon.” Ponthirwaun Ceredigion, UK, 23 January 2018. Skywatcher skyliner 200 P telescope, SkyWatcher 25mm wide angle, Dobsonian mount, Apple iPad 5th gen., 3.3mm f/2.4 lens, ISO 250, 1/17-second exposure. “A Magnificent Saturn” by Avani Soares (Brazil). “In high-resolution planetary photography having a good view of a planet is a key factor but also completely out of a photographer’s control. In this image, the photographer was lucky to capture our second largest planet, Saturn, in all its glory. After stacking 4,000 out of 10,000 frames we can admire details such as the beautiful polar hexagon, the Encke Division and even the crepe ring.” Canoas, Rio Grande do Sul, Brazil, 29 July 2017. “ISS sunspots (clip)” by Dani Caxete (Fernández Méndez) (Spain). 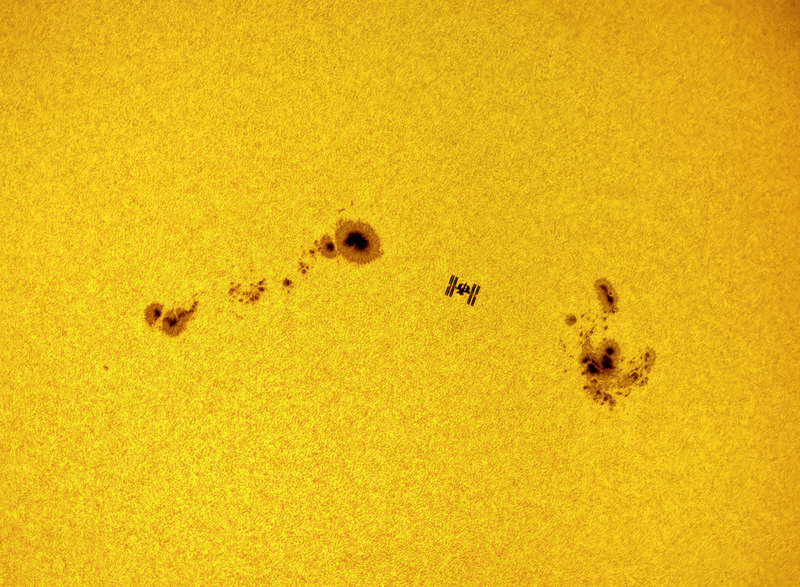 “The International Space Station (ISS) was captured between two massive sunspots, the AR 12674 and AR 12673, during its solar transit. The image was taken in Madrid and it took ISS less than a second to cross the solar disk.” Madrid, Spain, 5 September 2017. Long Perng ED 80 telescope, barlow x2, Herschel Prism, SkyWatcher Allview mount, Nikon D610 camera, 1100mm f/12 lens, ISO 1000, 1/4000 exposure. My Modern Met granted permission to use photos by the Royal Observatory Greenwich. 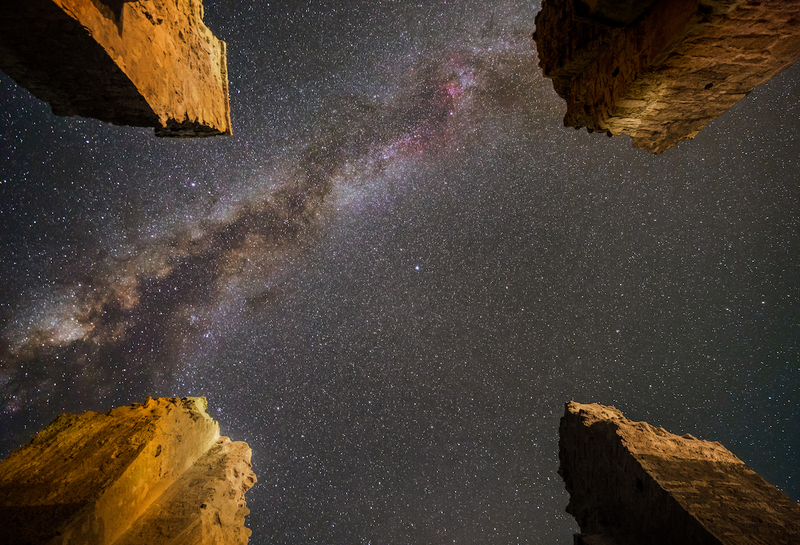 The post Spectacular Shortlist for Best Astronomy Photos of the Year Announced appeared first on My Modern Met.